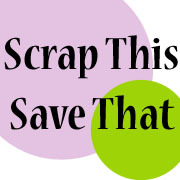 Scrap This, Save That: Happy Valentine's Day! So...this is what our house looked like this morning! Apparently the Valentine Fairy came and he was very gender oriented this year. Either that, or he just knows how much husband worships BACON! As he was leaving for work this morning, I noticed all the bacon buds picked off their stems, and I asked husband if he had put them in the fridge. He gave me a sheepish look and said, "No. I ate some of them and the rest of them may have found their way into my lunchbox to make the rest of the guys jealous when I heat them up for my second breakfast!" HAHAHA!! So I'm thinking the bacon roses were a hit this year! Here's the card I made for husband. Short, sweet and to the point. 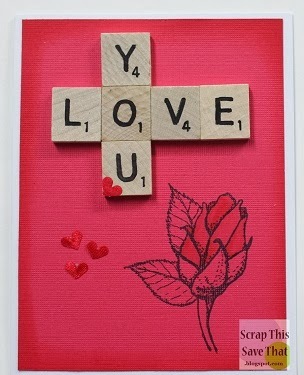 I used real Scrabble tiles, a stamp, and some Distress ink for shading. I LOVE it when a card comes together quickly! 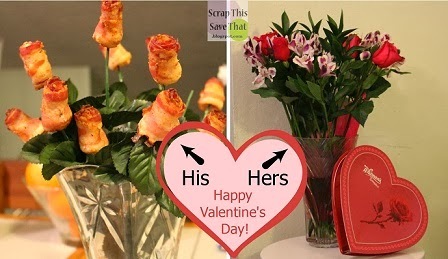 Love the bacon buds idea! Will have to try that next year!